ON THE HUNT was formed in the Spring of 2002 when 3 long-time friends decided to pick up their instruments again after a long break from the club scene. Creig Cooke, Chris Glenn, and Steve Gallo were determined to put together something unique and collectively agreed to create a tribute to one of their all-time favorite bands – Lynyrd Skynyrd.The three founding members recruited four other passionate, like-minded musicians sharing similar visions and the Skynyrd tribute was born. The tribute show lasted for two full years before running its natural course.Following the Skynyrd tribute run, the three founding members, along with bassist Keene Fleck moved on playing more diverse sets of classic rock including the best hits by artists such as Pink Floyd, Led Zeppelin, The Allman Brothers Band, and of course, Lynyrd Skynyrd, just to name a few. 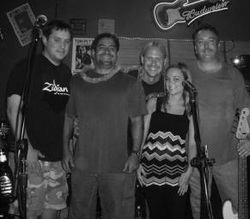 The band continues on today bringing “the best of classic rock” to the best music clubs in the greater Charleston area.